"We won't last five minutes if the Germans attack…" Lionsgate UK has unveiled a new trailer for a WWI drama titled Journey's End, which just premiered at the Toronto and London Film Festivals this fall. The film is based on a seminal British play about WWI, set mostly in a dugout in Aisne, France in 1918. The story is about a group of ragged British officers, led by the mentally disintegrating young officer Stanhope, who are awaiting their fate in this wretched place. The three officers are played by Paul Bettany, Stephen Graham, and Tom Sturridge, and the cast includes Sam Claflin as a Captain, plus Asa Butterfield as a young new officer; as well as Toby Jones, Robert Glenister, Oliver Dimsdale, and Miles Jupp. This looks like a solid, emotionally draining, riveting drama that is once again about the brutal horrors of war, specifically the trench warfare of WWI. I really want to see this, what a fantastic trailer. Take a look below. March, 1918. C-company arrives to take its turn in the front-line trenches in northern France led by the war-weary Captain Stanhope (Sam Claflin). A German offensive is imminent, and the officers (Paul Bettany, Stephen Graham Tom Sturridge) and their cook (Toby Jones) distract themselves in their dugout with talk of food and their past lives. Stanhope, meanwhile, soaks his fear in whisky, unable to deal with his dread of the inevitable. A young new officer, Raleigh (Asa Butterfield), has just arrived, fresh out of training and abuzz with the excitement of his first real posting – not least because he is to serve under Stanhope, his former school house monitor and the object of his sister’s affections. 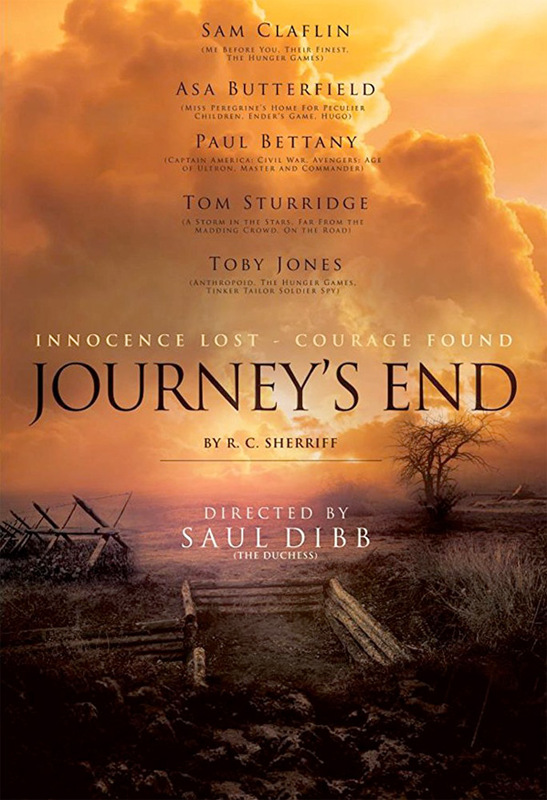 Each man is trapped, the days ticking by, the tension rising and the attack drawing ever closer… Journey's End is directed by English filmmaker Saul Dibb, of Suite Française, The Duchess, and Bullet Boy, as well as a few TV films previously. The screenplay is by Simon Reade, based on R.C. Sherriff's play. This premiered at the Toronto and London Film Festivals. Lionsgate will release in the UK starting February 2nd, 2018 early next year.